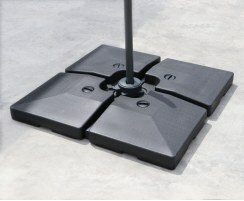 These fillable parasol bases will complement modern surroundings whilst keeping your patio parasol safe and secure. Fill with either water or sand to ensure your parasol will remain securely in place. View our range of water filled and sand filled parasol bases now to complete the look of your parasol and to enjoy the cooling shade. These fillable parasol base weights offer a pleasing, modern aesthetic that will effortlessly blend into any decor without compromising on safety. Browse the range of sand filled and water filled parasol bases today or contact us if you need any help choosing your parasol base.